Childhood obesity often persists into adulthood, and is associated with the risk of chronic diseases, such as type 2 diabetes, cardiovascular disease, hypertension, and metabolic syndrome. Epigenetic mechanisms, such as DNA methylation, are thought to be factors by which the fetal environment influences the adult phenotype. The POMC gene is located at chromosome 2p23, and spans 7,665 base pairs. In humans, the POMC gene has two CpG islands: one at exon 1 and the associated promoter region and the other, downstream, at exon 3. An epigenetic change in the hypothalamic neuropeptide POMC, which acts to inhibit food intake, modified glucose handling and glucocorticoids. We collected pregnancy outcome data from pregnant females, cord blood samples at delivery, and blood from children (7-9 years old; n = 90) through a prospective cohort study at Ewha Woman’s University, MokDong Hospital, from 2003 to 2005. 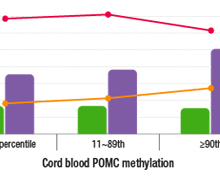 We divided subjects into three groups according to cord blood POMC methylation: the low methylation (< 10th percentile), middle methylation, and high methylation (> 90th percentile) groups. We analyzed the association of POMC methylation status at birth with adiposity and metabolic components glucose, triglycerides (TG), cholesterol, HDL cholesterol, and insulin in childhood. The average methylation of 49.51 in childhood was similar to that in cord blood. Additionally, cord blood POMC methylation status was strongly correlated with POMC methylation values in childhood (r = 0.80, p = 0.0001). In the high POMC methylation group, birth weight (p = 0.01) and ponderal index (p = 0.01) were significantly lower than in the middle POMC methylation group. Regarding biochemical parameters in children, TG concentrations were significantly higher in the high POMC methylation group than the middle POMC methylation group (113.89 mg/dL (95% CI 78.00-166.30) vs. 67.29 mg/dL (95% CI 59.96-75.52); p = 0.01). The insulin concentrations in the high POMC methylation group were also significantly higher than in the middle POMC methylation group (10.13 μIU/mL (95% CI 8.09-10.31) vs. 7.64 μIU/mL (95% CI 7.13-8.19); p = 0.02). 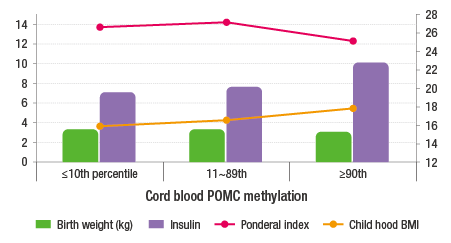 Our research, a high POMC methylation status in cord blood was associated with lower birth weight, and children with higher POMC methylation in cord blood showed higher triglycerides and insulin levels in blood. Thus, POMC methylation status in cord blood may be an early predictive marker of metabolic syndrome. Can Proopiomelanocortin Methylation Be Used as an Early Predictor of Metabolic Syndrome?